Many people in the West think that, in my country, because of our religions, because of our history, because of I don't know what, somehow we are more in tune with our spirituality, more at one with the forces of Nature. Well, we are! So well done, all those people who said that! A new project here at the PPCC: Make This Movie, Universe! 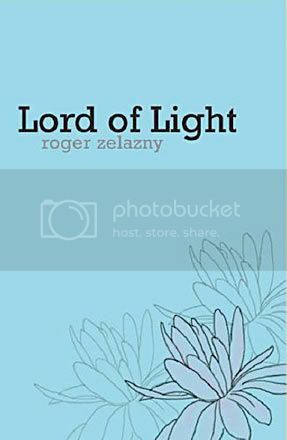 Roger Zelazny's Lord of Light is one of our favorite books. It combines cross-cultural pollination, spirituality and wacky science fiction with irreverence, comedy and genuine humanism. It is RIGHT up our alley. Plot: In the far, far, far future, Earth is dead and a nameless new planet has been colonized by the crew of an old ship (the "Star of India"). Living in a post-Singularity-type world, they use advanced technology to transfer consciousness from body to body, as well as get up to other fancy tricks (nuclear-powered chariots, for example). Many generations have passed since the original colonizing of the planet, and the original ship crew (the "First") have now manufactured a literal Hindu reality: they've taken on the roles of gods, reincarnating themselves into Brahma, Vishnu, Kali and so on, and meanwhile keeping the rest of the population (their descendants) stuck in a superstitious, pre-industrial society. The new British (?) cover. Classy. One of the "gods" becomes disgusted and disappointed with this endless, unfair cycle of reincarnated oppression, and he decides to shake things up a bit by repeating Earth history and introducing Buddhism. Adopting a new body and calling himself Prince Siddhartha, he goes through the motions of the original story of Buddha - who, for those a bit rusty on their 2,500-year-old Indian history, rose to be one of the main challengers to the Brahmin/Hindu hegemony of the time. Annoyed, the other gods exile him and eventually there is a great battle over the fate of the new planet's humanity and - especially - its soul (if, well, Buddhism believed in a soul). The book is chock full of hilarious anachronisms and philosophical ironies that turn your brain pretzel-shaped. Shiv Sena's probably not going to like it - the crew member currently reincarnated as an ultra-macho Brahma was a lesbian originally. Similarly, Christian fundamentalists might be annoyed by the subplot of the ship chaplain who rebelled against the faux Hindu hegemony and attempted to mass convert the planet to Christianity using an army of zombies, meanwhile earning the moniker "Prince of Darkness" for himself. And what would Buddhists think of the idea that you can "fake it 'til you make it" on the way to Enlightenment? Or the mish-mashing of the critical atman/anatman (i.e. soul/no-self) discussion? Well, the book's vibe is more comedy than provocation, and its gentle probing of philosophical issues and ambiguous interpretation should make it stimulating and palatable to anyone who likes to think about this sort of stuff. Such as the PPCC! The film: Now the ever-enthusiastic PPCC is not the only one who thinks this would make a great film. Indeed, Zelazny sold the book rights way back in the 70s, and a truckload of money was set aside to film it and then later market the sets as a science fiction theme park (!). This idea was shelved and then - another twist in the increasingly weird story - the script was used by CIA agents, who posed as film producers, in order to rescue Americans during the Iran hostage crisis! REALLY! Gosh! They could make a movie about making this movie! The dream: What would make this movie the end-all, be-all coolest movie ever? Well: the perfect cast and crew, of course! And who would they be? We'll tell you. 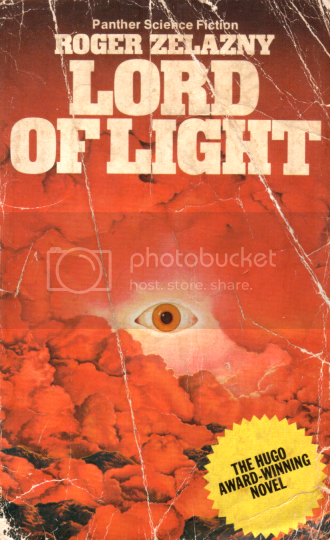 Since a Lord of Light film would require a sort of primordial, steampunk-ish, Vedic/pre-Vedic-era India setting, as well as the sci-fi spectacle that is the "Mount Olympus" heaven zone, we need a director with a strong, saturated, zany vision. Our top choice would be Terry Gilliam. He of former Monty Python fame, we think his bizarre, LSD aesthetics (as seen in Fear and Loathing in Las Vegas) would be perfect for the acid trip that is this neo-Hindu/neo-Buddhist world of fakes and charlatans. We also think hippie-fying the proceedings would add an interesting meta critique of the whole Karma Cola hippie trail "New Age"-ist misunderstanding of Hinduism and Buddhism. Eh? EH?! Otherwise, Mira Nair... no, not because of Monsoon Wedding or (our beloved) Mississippi Masala, but because of her oft-overlooked Vanity Fair, which featured flamboyant fashion (Jonathan Rhys-Meyers' hairstyle, ho ho ho!) and the most spectacular, elephant-riding "oh, dammit, let's just move to India!" ending ever found in film. The "hero" role of Sam would require someone who is at once down-to-earth and epic. Someone who can project a sense of superheroics coupled with Everyman good humor. And who is the best Everyman superhero? Duh. Anil Kapoor. And if Anil Kapoor's going to be Sam, then clearly the role of Kali - who was Sam's wife in previous incarnations, but is now his arch-nemesis - must go to Madhuri Dixit. No, we never miss an opportunity to sell Anil/Madhuri. And what a comeback vehicle this would be! Jeevan Ek Sanghursh = Life is a struggle. AKA the First Noble Truth, according to Buddhism. Coincidence? WE THINK NOT! This film - this cast - clearly, it was meant to be! A pox on you! Hex, hex! ...and voila! It would be delicious. I didn't enjoy the only Zelazny novel I've read, so I don't think this will be finding its way to my to-read pile...but you sold me on the movie! I find myself slightly afraid of you now. memsaab - Got one! Yay! Amrita - Why?! Because I had the courage to vocalize what everyone was thinking anyway!? Typical euro-centric hogwash, full of it, yes Buddha come to challenge & destroy Hinduism, some old half witted western analyze of classes & power struggle, that every thing happens in world as did good old Europe. And everyone should agree that Brahmanism is Hinduism because a good euro-centric said so. Oh goody, thank once again for saying Hindus are 'superstitious', & live in 'pre-industrial society'. Everything Industrial is progress! yes we know, so is Global warm & the rest. Everything written in Wikipedia about the Vedic period, Hinduism & Buddhism are true facts written in stone. So why not making it movie, so that we Hindus sit down silently & take all this rubbish, Thanks of enlightening us. Oh & forgot, your post/reviews on Bollywood Movies are so full of it, that dude was right, take a gun & get over it. Actually I come to your blog for something different but got whole lot different euro-centric rubbish A+ for racism & mixing cultures, & here we are admiring anglicized heroes & leads, oh why not watch them because they look so white, yes Sashi the pretty boy. And What is wrong in wanting a wife who does not drinking & party, & dance with other men because he himself does not do that, isn't marriage & love between the likes & not opposites? But no he is backward typical backward Hindu from Kashmir. Your great guru Prof. Philip Lutgendorf is always right about Hindi cinema. Anonymous(e) - Ooh, the odd angry comment! Simply too hard to resist replying. 2. Oh goody, thank once again for saying Hindus are 'superstitious', & live in 'pre-industrial society'...I knew someone would get annoyed by this! You'll just have to take it on faith that I don't think Hindus hold an exclusive right to being pre-industrial and superstitious, but rather that any religious hegemony's authority is strengthened by maintaining a superstitious and pre-industrial society. If you think I have some personal, arbitrary beef against Hinduism, or that Lord of Light/Zelazny is uninformed, Euro-centric trash, you'll have to provide better evidence than "Hinduism is portrayed as superstitious in the book, and that's not fair". Christianity is also portrayed unfairly (and made up of zombies!). Buddhism is portrayed as a convenient political maneuver. If you mistake less-than-perfect portrayals of (fake, I emphasize) Hindus as offensive/uninformed, you're... well, setting yourself up for often feeling offended. 3. Everything Industrial is progress! yes we know, so is Global warm & the rest.I'm going to Spock you, and point out that this is a logical fallacy. - Therefore not everything industrial = progress. Your error, I think, is in conflating a negative side effect of the Industrial Revolution (which now results in global warming) with being enough to disprove industrialization as a contributor to progress. Is global warming really not progress? What if it's a stepping stone? What if further industrialization along "green" lines leads to clean development and a stop to global warming? I'm not saying it does, I'm just saying your argument is sloppy and weak. 4. ...So why not making it movie, so that we Hindus sit down silently & take all this rubbish, Thanks of enlightening us.Oh, angry anonymous commenter. You've ranted about how wrong my review is, without providing any evidence to back up your claims. And you've fundamentally misunderstood something: my good will to Indian culture, and my desire to learn more about it. It's so frustrating to just read angry rants, such as yours, that teach someone nothing about what they're purportedly about. If you're proud of your culture and want people to respect it, why don't you spread understanding and knowledge about it? Instead of your own highly emotional, somewhat cowardly (i.e. anonymous replying?) troll-like comments, which only alienates people. Here, to get you startedd: What is a better source of understanding Hinduism, if Wikipedia is so wrong? Vedic history? If industrialization can't help sustainable Indian development, what can? (Please enlighten me on this - you can write my PhD!) What was Siddartha Gautama's role in developing Brahmic philosophy (if any)? Put down your weapons, I mean you no harm, and let's learn from each other. Just reread the book, and thought "there should be a movie!". When on internet, found your page, started reading... and found out you say they should make a movie about that CIA stuff AND THEY ARE DOING IT! Just saw the trailer. It's gonna be called Argo. Now I have the perfect excuse to talk and talk and talk about Lord of Light.